It is with some shame that I acknowledge that I’m a fan of Brené Brown, a shame researcher. I don’t want to be a fan. She is way too popular, way too smart, and way too much a cliché for the manly man I’ve always striven to be. “Jeremiah Johnson,” the old movie Western from 1972, is my role model for a man. A stand-alone guy. Tough. Gutsy. And able to survive against all odds. Yup, that’s me. A Mountain Man. Oddly enough, the “Mountain Man” approach hasn’t worked that well for me. When the old prosecutors, after a day of trial, would say, “Joe, let’s have some whisky to celebrate,” I’d look around the bar to see if they serve chocolate malts… with maybe a little whip cream… and a cherry. And how about fixing a car, or pounding a nail, or cranking a wrench? Sorry, my wife still watches the neighbors with envy as the husbands fix and hammer and repair while I’m doing rolling-like-a-ball in Pilates class. Nope, Jeremiah Johnson I am not. Which, of course, gets me back to Brené Brown, who advocates embracing your vulnerabilities as a pathway to dealing with shame. Of course, who wants to do that? I certainly don’t want to embrace anything but a donut. But facing uncertainty and risking yourself is apparently the ticket out of the shame party. Thus, the FiveFinger Vibrams. You know what I’m talking about. The totally dorky shoes that have five toes splayed right out there for the world to see. I love them. I could argue to you that since I was in an accident, they allow me to feel the ground in a way that gives my numb feet some balance. That would be true. But, really? I just love how they feel. Period. But don’t get the wrong idea, they are the opposite of cool. One of my Dutch friends is Margreet. She is kind but unfailingly honest. For instance, she asked me when I first arrived in Holland why I had grown so fat. You try to answer the “why” of that question. When I asked her about my FiveFinger Vibrams, she said I should do what I want, but the shoes are “a little strange.” This is from the most tolerant people in the world! And I don’t stop at shoes; I also love hats. Pretty much any kind of hat. And since I have a large head, and the wind blows incessantly in the Netherlands, hats generally perch precariously on the top of my head unless I tie them down with a nice string around the chin. Very stylish while you bike… and very similar to hats worn by circus clowns when they are peddling around the ring on their unicycle while juggling balls. I know this. I asked Margreet what she thought of my hat. “The string around the chin? Really?” She shook her head. Ah, but then I got a physical challenge. 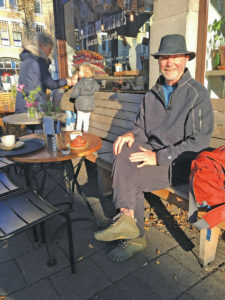 My therapist (that acknowledgement alone kicks me out of the Mountain Man Club) said she’d love a picture of me at an outdoor cafe in my shoes and hat. Really? Both at the same time? Here in the Netherlands?